For many, Iowa's claim to fame occurs every four years when the state is thrust into the national spotlight during the presidential campaign. But the state is important for another reason: It's sustaining American manufacturing. Iowa boasts over 200 companies -- that make everything from popcorn to car parts -- that have been in the state for 100 years or more. "Iowa is a rural state where agriculture is dominant," said Maureen Collins-Williams, partner at Entrepreneurial Communities, a consultancy that specializes in manufacturing. "But people will be surprised to learn that manufacturing is an even larger industry here." Manufacturing accounts for 18% of the state's GDP -- second only to financial activity. There are more than 6,100 small to medium-sized manufacturers in the state, according to a report from Iowa State University published in July. And most of these firms are decades old. "The majority of manufacturers in Iowa are over 30, 40 years old," said Ronald Cox, associate dean at Iowa State University. "It's much too expensive to start a new manufacturing operation today because of the high cost to buy a plant and machinery." 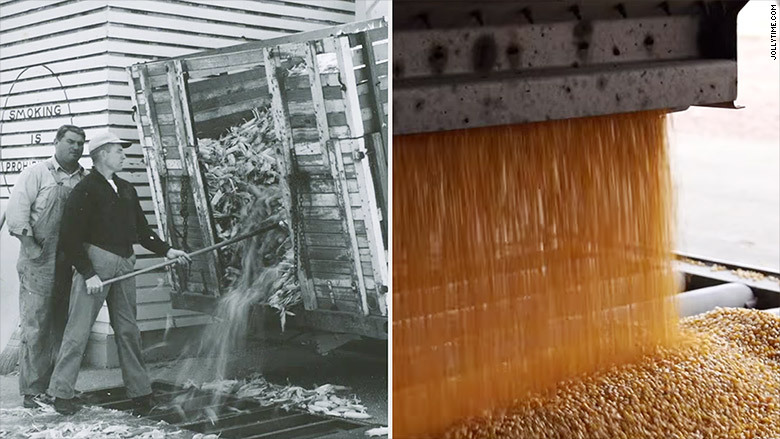 In 1913, Garrett Smith's great-grandfather grew corn on his acres of farmland. But when prices for the grain dropped, he decided to launch his own business -- a popcorn company. 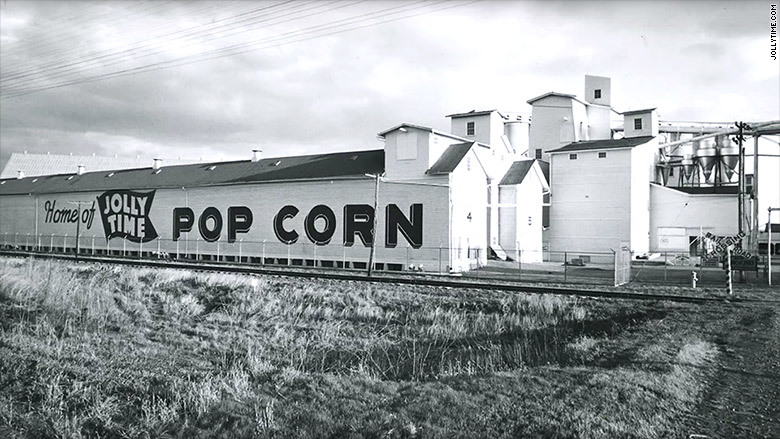 Smith's great-grandfather and grandfather both hand-shelled the first crop of Jolly Time Pop Corn in 1914 in the basement of their home. 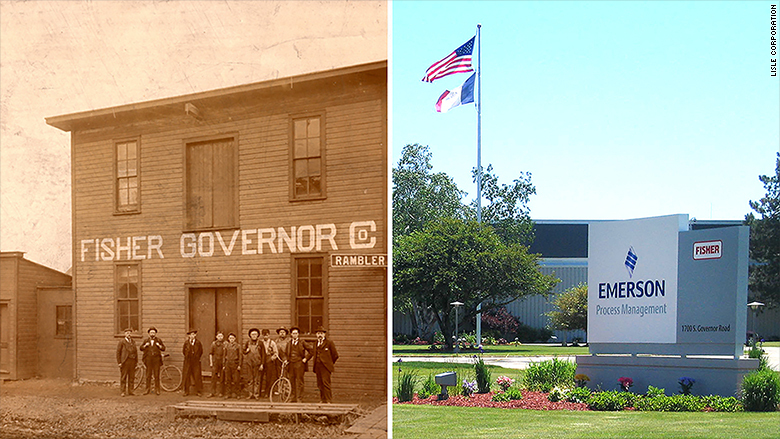 As business grew, the factory moved to "One Fun Place" in Sioux City, Iowa, where it's been since 1916. "As far as we know, we are the oldest brand of popcorn in the country," said Smith, president of Jolly Time Pop Corn. The company has 180 employees and sells 100 million bags of popcorn annually to stores like Wal-Mart (WMT) and Target (TGT). "One reason for our longevity is that we're very nimble," said Smith. "Our small size helps and so does our culture. There are no management layers. When a salesman needs an answer from me, I answer him the same day. We make a decision and move on." The family-owned business started out as an ice cream maker in 1905. As the business grew, the owners bought a large creamery in Clarinda, Iowa, in 1912. "My grandfather and his brother were cleaning out the creamery and found a safe," said Kirk Tyler, president of Atlantic Bottling. "In the safe was a franchise contract for Coca-Cola. 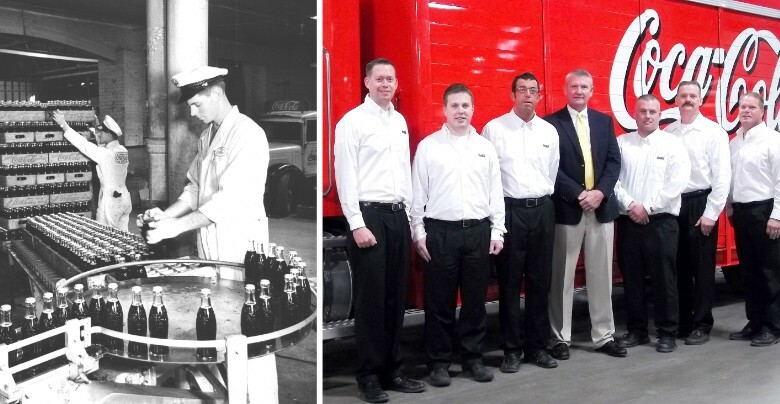 Back then, no one in Iowa knew what Coca Cola was." But the Tyler family used the contract and started making and distributing the soda. Today, the business has 75 employees and makes, bottles and distributes Coca Cola (CCE) beverages in the state. "We've stayed put for this long because of the hardworking and educated people here," said Tyler. "We've invested in the communities where our employees live, work and raise their families. It helps that wages are also competitive." William Fisher, the chief engineer of Marshalltown, Iowa, invented a control pressure valve after a massive fire hit the downtown area in the 1870s. Fisher saw how difficult it was for firemen to maintain constant water pressure using a hand-controlled system, said Paul Gregiore, global vice president at Fisher. That was 135 years ago. Today, Fisher is one of the world's largest makers of control valves, which are used in everything from oil and food to pulp and paper manufacturing. The firm has changed hands only twice in its history and was acquired by Emerson Electric Company in 1992. The plant is still at its original location where it employs 1,200 people. How has Marshalltown sustained Fisher this long? "We're very fortunate to find the talent here," said Gregiore. "In fact, we have 400 engineers [who are] all from the area." "People don't know that Iowa State University has the eighth largest undergraduate engineering college in the country," said Cox, adding that about half of the graduates are hired by local companies like Fisher. The family-run manufacturer in Clarinda, Iowa, first started out making horse-powered well-drilling machines. Over the years, its portfolio grew to include a diverse array of products like vintage washing machines and lawn mowers. But in the mid-1920s, Lisle expanded into automotive tools and repair products, and even made components for the Ford Model T. Today, that's the company's bread and butter. 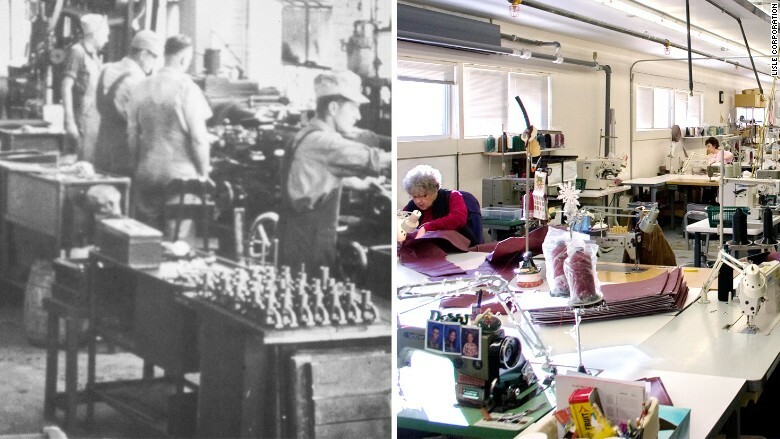 "We make 450 different specialty tools," said Mary Landhuis, whose family founded the company. The company employs 250 people, many of whom have spent their entire career there. "They joined us out of high school or college and stayed," she said. "The advantage to us is that we've built a very knowledgeable and loyal workforce that drives our innovation and creativity."